You want a wedding that your guests will talk about for years to come. While there are many creative ways to jazz up banquet facilities and hotel ballrooms, you still yearn for a venue for your wedding that goes outside the box and will dazzle your guests. Destination weddings are extremely popular but may not be practical for everyone you invite. You want to include everyone while still going off the beaten path. The solution is the many traditional alternative venues. Lakeside and ocean-adjacent locations are perfect for weddings. Their lovely vistas and serene surroundings make for a beautiful backdrop to your wedding and will yield photographs and videos you will enjoy for years to come. Find a waterfront resort with amenities such as a spa, gym, pool, or sports courts for your guests to enjoy before and after the wedding. If you are adventurous, consider having the ceremony on the beach. A wedding near water also gives you the option to choose a yacht or larger vessel, such as a former ferry boat that might have been converted to a restaurant with banquet facilities. A farm can bestow an earthy simplicity upon your wedding. A farmhouse, barn, apple orchard or even a pumpkin patch are all sites with rustic ambience. You can include some farm animals in the proceedings—the bridal party arriving on horseback, for example. The reception can be under the stars or indoors, depending on the farm’s facilities. You can also rent a tent. Mountain inns and lodges are also a wonderful choice. The grounds of a mountain inn are a lovely setting for the ceremony with the reception being held inside. Wide open spaces make great backdrops for wedding photos too. Colorful flowers, plush green shrubbery and towering trees of a botanical garden–what better setting for your wedding? There are usually several types of gardens to choose from for the ceremony, and a tent can be constructed for the reception. You can bring the beauty of the natural surroundings inside the tent by using a transparent one. Arboretums and even a hothouse can also be used for part of the proceedings, such as cutting the cake. Photos can be taken in many areas of the grounds. Gazebos also make great places to take photos. Short tours can be arranged—for example, of one of the greenhouses–for your guests during the reception. Wineries and vineyards abound in many areas–there are over 6,000 in the U.S. alone. Amid unforgettable sunsets, star-studded skies, and vine-covered arbors, your wedding will truly be a romantic event in wine country. The architecture of many wineries evokes the courtyards and rustic barrel rooms of the most beautiful European wine-producing areas, such as Tuscany in Italy. The deep plums, rich greens and burgundy shades inherent in the grapes can form the basis for your wedding’s color palette. A wine-tasting can precede dinner. You can also send your guests home with winery-inspired favors, such as personalized wine charms, bottle stoppers or even a bottle of wine. 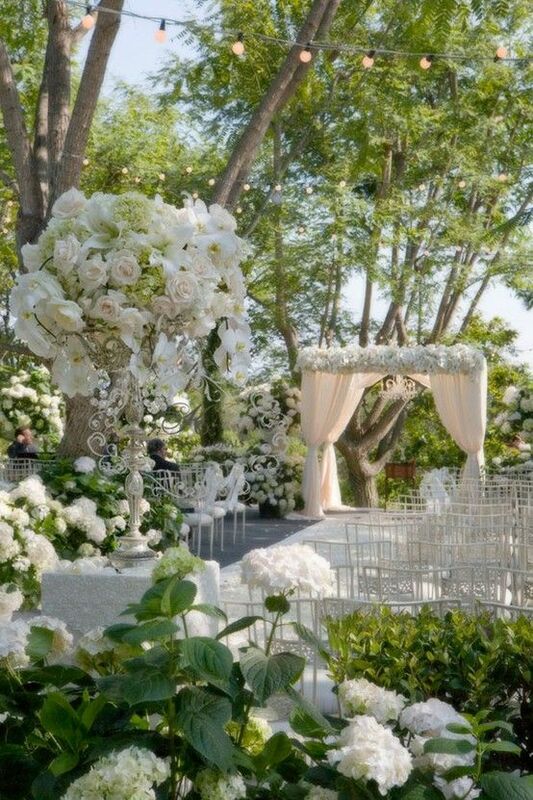 You are your own boss when you arrange a backyard wedding, which can run the gamut from casual to elegant. Just make sure the area is large enough for the number of guests you expect to have. Stage the ceremony in an area of the yard that is free of rocks, holes, uneven ground and other hazardous features. You can lay down a white runner, bring in white chairs, construct a canopy over the clergyman and the bridal party, and frame it all with stanchions, large plants or trellises of flowers. Hire a caterer and rent a tent for the reception; it can be free-standing or attached to the house if there are patio doors or other wide opening guests can use to pass between the tent and the house. Wedding planners are well-versed in the availability of museums, galleries and historical buildings for hosting social events. If you live in a large metropolis, you will find a variety of venues in this genre where you will have your choice of caterers. Some will even permit you to bring your own caterer into the facility. Decorating options are endless so you can be very creative. In smaller communities, you can consider historic homes, libraries, even classic train stations that may be available for rent. Unusual modes of transportation, such as a trolley car, jitney, or horse and buggy, can be found in small towns and make fun places to tie the knot. A hangar at a local small airport can be wedding-compatible for aviation enthusiasts. Whatever your style or theme, there are many options for brides and grooms beyond the catering establishments and hotels. Don’t be afraid to be bold! Very good post. I certainly love your site. Keep writing! Choosing a wedding setting is one of the first and biggest items to check off your wedding planning list.Yes, we really want to have a wedding venue that goes outside the box and will dazzle our guests. I best prefer a wedding on the water since the serene surrounding will really make a beautiful backdrop for the wedding. It will be most special if on a yacht. Seafair https://www.seafairmiami.com/ is what I have in mind. This mega yacht will give you the best wedding you’ll ever have!